Welcome to the world of Atlantis.. the original world! These are the first words which to introduce the viewer to this amazing documentary and interestingly enough, what little words exist in this movie are all in French which makes this such as a powerful experience. Created by French director Luc Besson, he has truly created some monumental films in his diverse career from the visually stunning The Fifth Element to the more surreal and recent The Messenger. However his lengthy CV has not always been about movies and this is where Atlantis comes into the picture, a colourful and stunning documentary about the creatures that live beneath our blue ocean. Joined by cinematographer Christian Petron and composter Eric Serra, this trio create a thoroughly entertaining experience thanks to the high quality footage as the viewer almost feels like they are face to face with these majestic creatures from fish to whales. To compliment these visual images is the interesting score of Eric Serra who uses a variety of genres to portray these creatures from Arabic themes for the Banded Sea Snakes or something more modern and poppy for the fun loving Sea Lions from Galapagos islands. Unlike most documentaries, Atlantis - A world Beyond Worlds does not focus on just one aspect of this underwater habitat as the photographers explore ship wrecks, reefs and even icebergs which these wonderful creatures call home. The documentary is also split into chapters or themes such as one called Hate which involves the sharks or Love which involves underwater love making. In terms of content, Besson gives the viewer everything they would expect and want to see underwater such as the spotted dolphins from the Bahamas to the majestic giant octopus of Vancouver to something more dangerous, such as the Great White Sharks of Australia. On Blu-ray, the video quality is quite exceptional with larger than life images and a truly vibrant colour palette. However what makes this documentary so memorable and as mentioned is the musical score from Eric Serra which adds an element of mysticism and really activates all your senses. This score changes with the creatures that are being filmed, whether it’s the great white sharks or the playful dolphins, it all comes together like a well written film. 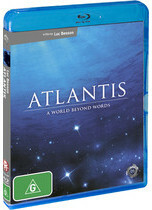 In conclusion, Atlantis - A world Beyond Worlds will easily be one of my favourite documentaries of all time as we are given an exclusive pass to this underwater wonderland through visuals and music. Best of all, the documentary does not preach the information but through the cinematography of Christian Petron, it portrays this information on a higher level. The only thing lacking are the special features which is only the theatrical trailer. Still, it's definitely a must have documentary for those with a quality home entertainment setup!